This money clip has a stamped sterling silver piece that is set on top of the nickle silver money clip. 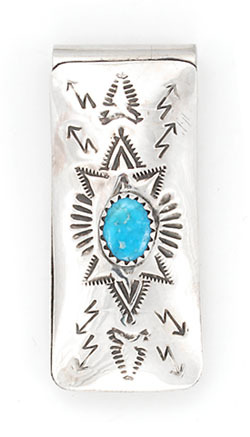 It has a oval stabalized turquoise stone in the center and measures approximately 1 3/4" long by 3/4" wide. Crafted by Navajo artisan Arlene Soce. Stamping will vary as well as color shade of stone.